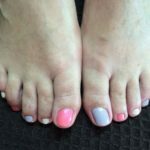 We offer a lovely range of pedicures that all include the use of GELISH- Soak-Off Gel Polish. Gelish® Soak-Off Gel Polish applies like polish and cures in a LED lamp in 30 seconds. Gelish stays on nails for up to 3 weeks with no chipping or peeling, and soaks completely off in only 10-15 minutes. Callus Peel is an effective foot treatment that removes hard, callused skin leaving your feet feeling soft, smooth and revitalised. Calluses appear when pressure is applied to the feet over time, causing the skin to harden and calluses to appear. To treat both feet, this amazing treatment only takes 25 minutes. We recommend a treatment every 4-6 weeks, although results are seen after the first treatment! The treatment targets the hard skin / calluses on your feet with skin softening patches followed with scrapping away the hard skin leaving your feet feeling soft, smooth and hydrated. Contra-indications – Pregnant ladies not recommended. Clients with Diabetes can be done but with caution discuss with therapist before booking treatment. Clients with Psoriasis can be done but with caution discuss with therapist before booking treatment. How long does it take? To treat both feet, it takes only 20-25 minutes – 10-15 minutes for the patches to soften the skin and 5-10 minutes for the rest of the treatment. How often should I have a treatment? It depends on your lifestyle and what type of shoes you wear but we recommend a treatment every 4-6 weeks, although results are seen after the first treatment. Callus Peel is a treatment not a cure. What are the main ingredients used in the patches? Skin Softener Sachet: Aqua (Water), Glycerin, Alcohol, Sodium Hydroxide, Carbomer, Citric Acid, Tartaric Acid, Lactic Acid. Does the treatment hurt? No, it doesn’t hurt at all – it might feel a little ticklish.